After riding at the barn the other morning, Emma came home with two quarts of blueberries. Birdy prefers them straight out of the box. But this also means that I am stepping on blueberries rolling around my kitchen floor for the rest of the day. A small sacrifice for her blueberry joy, but still…. I have a strange like/disklike of blueberries. I like them in things, I dislike them straight out of the box. Smoothies and Buckles. That's my thing. We were discussing the origns of the "buckle" over dessert the other night….Mary wanted to know why the dessert was called a buckle. I suggested that it might be because the topping of the cake "buckles" and cracks as it cooks. Dan suggested that it gets its name from the fact that one must "loosen their buckle after having several pieces." 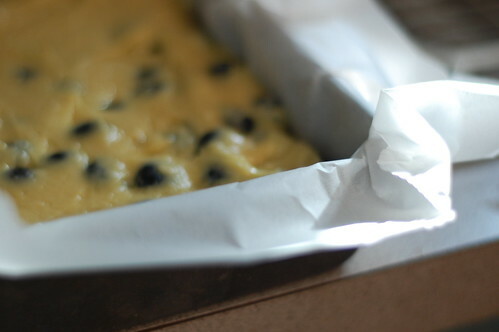 Everyone probably has their version (or the exact same version) of the blueberry buckle. I have to apologize that I have absolutely no source for mine. It is scribbled on a notecard in my recipe box and I've been baking this version for the past three summers. And it's a total winner. I recommend it for dessert, then breakfast and lunch the next day. Cream sugar and butter. Add egg. In a separate bowl combine the dry ingredients and stir into the wet ingredients, alternating with the milk. 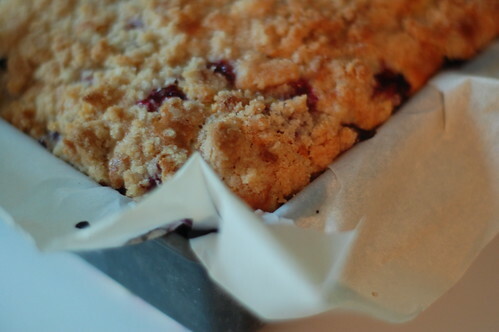 Fold in berries, and pour into a greased or parchment-lined 8 x 8 inch pan. Mix together and sprinkle over top of buckle. Bake at 375˚ for approximately 25-30 minutes. My mom makes blueberry buckle for Christmas. And it’s delightful. Well your husband does love blueberries. Maybe Birdy gets it from him? I think you are right about the name, at least that’s what all the cookbooks say. That looks so yummy! Our blueberry bushes are new and we only go 10 blueberries this year. But I’ll be saving this recipe for next year. I’m hoping they do much better next year. I came over from Soule Mama – great guest post! Delicious; can’t wait til our blueberries come on here. Loved your post at SouleMama. That looks so yummy. I thought I was probably the only person in the whole world that didn’t like to eat fresh blueberries plain. I do like them plain when they’ve been frozen though….kind of like bite size smoothies! Thank you for sharing this recipe. I made it this morning using strawberries (it’s strawberry season here) that I cut into blueberry sized pieces, and it is absolutely amazingly delicious. I feel about ALL berries like you feel about blueberries, so I’m doubly grateful for this awesome recipe to use berries in. Thank you! Hi there. I just read your guest post on SouleMama and wanted to come and visit your blog. Thank you for your words in your guest post. As women, I believe we all have the intuitive voice that is sometimes very hard to distinguish from other peoples’ chatter that we carry around in our mind from childhood thru present day. Unfortunately, I think we tend to hold on to the negative chatter more than the positive. Your positive is serving you well!! It sounds like you have a good Mama!! : ) I look forward to catching up on your past posts. Have a wonderful day!! We picked a huge bucket of blueberries last year. This year we didn’t have that opportunity. Most of them were eaten as is. Very few were left for a buckle. So delicious! Thanks for a great recipe! 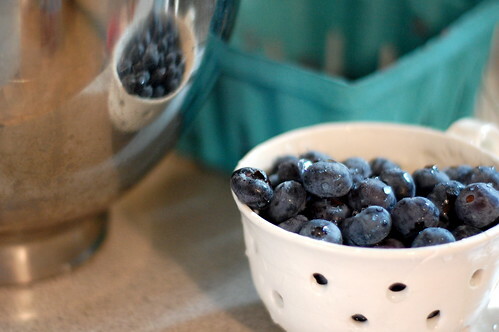 We were just on the Eastern Shore of Maryland last week picking blueberries with friends who live there and I have just enough left to make this recipe. Happy Summer! I am much the same with my blueberry preferences…IN not straight away. I’ll definitely be trying this buckle. I’ve never done it before, and it seems like a worthwhile recipe. This is the same recipe I got from my Grandma and is always a hit! Now, I’m in the mood to make it, better loosen my buckle! ooh. made it for the fourth…a great hit. and a double batch, so some went in the freezer too. delight! thanks again.